Before the advent of Xboxes and all-singing smartphones, kids signed up to a vivid, multi-sensory game accessed through a portal at the far end of the kitchen, known as “outdoors”. In the black and white era - albeit slightly rose-tinted - this was unfettered by health and safety, the dress code comprising short trousers, grazed knees, cheeky grins and cockeyed fringes. The social backdrop was industrial, as was parenting. Woe-betide any child who got under mother’s feet. So after breakfast they were swept into the real world to learn about life through the unique experiences it flung at them. That culture shaped today’s generation of retirees and those, like me, who still remember coal mines. Also amongst the latter is Stephen Mackey who grew up at the head of the Rhondda Fawr valley, blessed with an adventure playground on his doorstep. But there was one particular place that drew him back time after time. A short walk from home was a railway tunnel, two miles in length, through which there was no traffic on a Sunday. So he’d take a candle, put it in a tin, and venture forth into the darkness. Near its midpoint, the tunnel abruptly widened for a few yards, a spot he knew as “the church”. Here he would sit for hours, reflecting on the courage and resolve of those who had pushed this passageway through the hill 80 years earlier. For reasons he never fully understood, he felt at one with them. Confrontation with officialdom was an ever-present threat, but this diminished in 1968 when passenger traffic ceased, disenfranchising communities in this remote corner of South Wales. With the help of two mates and a 40-foot rope, Stephen repainted the commemorative cover stone cemented into the east portal’s headwall, appending his name and the request “please open me”. Then in 1980, with locals persistently breaching the tunnel’s protective blockwalls, the county council arrived to infill the approach cuttings, bulldozers burying their liability beneath tonnes of earth. Stephen watched on with a lump in his throat as part of his childhood vanished. As he headed home, he looked back and shouted “I’ll open you one day” - the sort of thing you do as an impassioned youth before the burdens of being a grown-up come to bear. 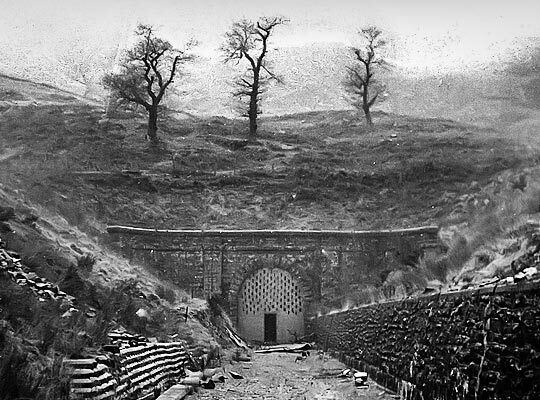 The epitome of bleakness: a Seventies view of the tunnel’s now-buried eastern portal at Blaencwm, with its three famous trees above. The decades that followed brought industrial decimation to the once-thriving upper Rhondda. Though the physical scars have now healed - revealing a spectacular landscape - economic deprivation still blights the area. Stephen felt this personally a couple of years ago when he was made redundant. With such events comes the need to refocus, a process that often benefits from a good walk. And so on a late summer afternoon he found himself in Llwynpia, a couple of miles from home, wondering what to do next. The answer came to him as he passed some blackberry bushes, his attention being drawn to something in the undergrowth. It was a moment of bizarre happenstance. Pulling back the branches, revealed to him was the cover stone he had painstakingly repainted 40 years earlier. Life since has been unrecognisable. Through the 1870s, increasing coal production in the Rhondda severely tested the handling capabilities of its monopoly carriers, the Taff Vale Railway and Cardiff Docks. Return journeys typically took two days. This background of crippling congestion spurred the merchant folk of Swansea - where new coal shipping facilities had opened - to develop proposals for the Rhondda & Swansea Bay Railway (R&SBR). Incorporated on 10th August 1882, it established a shorter export route via the Afan valley but, to reach it, the line would first have to overcome a 1,700 feet high natural barrier, Mynydd Blaengwyfni. Set that task was engineer Sydney William Yockney; his father, Samuel Hansard Yockney, had acted as engineer and manager for the contractor at Box Tunnel, bringing him to the attention of Brunel for whom he went on to fulfil a number of other tunnel projects. Work on the R&SBR was split into three contracts, No.3 being awarded to William Jones of Neath. 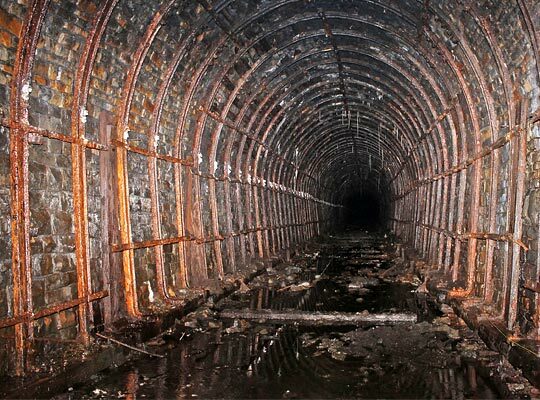 Included within it was the construction of Rhondda Tunnel, the second longest in Wales at 3,443 yards; serving as the resident engineer was William Sutcliffe Marsh. The western entrance at Blaengwynfi. The only shaft can just be seen above the portal’s left-hand wing wall. Ground was first broken on 30th May 1885, completion being due within three years, but delays in securing land at the eastern end prevented any substantive progress there for another 15 months. Yockney’s reports to the company directors were initially positive, with good ground conditions encountered and little water ingress. The headings were being driven through sandstone at a rate reaching 240 yards per month, the miners working from shafts in the approach cuttings at either end and another just in from the western entrance. With ground cover exceeding 900 feet, the conventional approach to expediting progress in lengthy tunnels - the sinking of intermediate shafts - was deemed impractical. However the miners did benefit from rock drilling machines, operated by compressed air which was generated by a pair of horizontal engines and stored in an iron tank before being passed into the tunnel. The machine’s exhaust acted as effective ventilation at the working face. The tunnel was buried and a narrow access shaft created in 1980. Despite the miners’ industry, alarm bells started ringing early in 1887 when progress started to slip; according to William Jones, this was the function of a manpower shortage and the underground springs encountered at the east end of the tunnel. Reluctantly, the company pushed back the contractual completion date to 31st July 1889. But it wasn’t until 16th March that year, with only 20 weeks to go, that the headings finally met, Yockney recording that the levels were out by just half-an-inch whilst the line was perfect. In celebration, the contractor entertained a hundred navvies to supper, song and recitals at a nearby hotel. This constructional high-point acted as a counterbalance to the lows that inevitably attended. John Harris, 24, killed by an explosion; William Shod, a haulier, run over by a wagon and fatally injured; Isaac Watson, 36, also succumbed to dynamite. And then on 22nd January 1889, news of a huge rock fall spread across the district; seven deaths were reported. Although an exaggeration, the reality - two victims - proved no consolation to the families of George Lever, a 28-year-old miner, and labourer George Smitherham, known to everyone as “Soldier”. Gangs of men laboured for many hours to extricate their bodies from the debris. With the rate of advance falling to 70-odd yards per month, the company dispensed with William Jones’ services in September 1889, bringing in Messrs Lucas & Aird from Westminster. 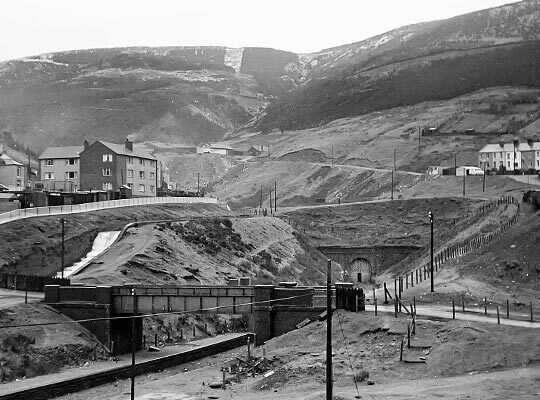 Employing 1,600 men to finish the line, they set about erecting 300 houses at the Rhondda end and, for four months, workers in the tunnel benefited from new-fangled electric lamps. The venture was back on track. Master Stonemason Jimmy Reynolds finishes off the cover stone’s new front plate. When Colonel Rich fulfilled his inspection duties for the Board of Trade on 2nd May 1890, Yockney was confident of a tick in the box. He had though not accounted for Rich’s expectation that the tunnel be fully lined. So, before he would pass it as fit for passenger traffic, 759 yards of brick arch would have to be inserted, springing off arched-concrete sidewalls. Operations resumed the following day, Lucas & Aird having already prepared for such an eventuality; completion came just 54 days later, allowing the tunnel to start earning its keep on 2nd July 1890. Wise practice in mining areas was for railway companies to buy any pillars of coal that supported significant structures. Failure of the Lancashire Derbyshire & East Coast Railway to do so resulted in Bolsover Tunnel sinking by eight feet in 60 years. 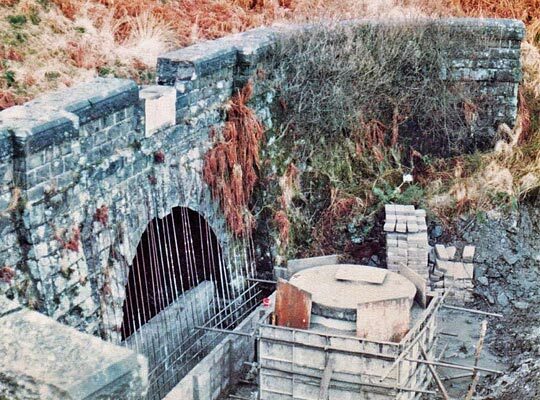 The R&SBR fell into the same trap of short-term economics, the upshot being areas of worsening distortion resulting from seams being worked both above and below Rhondda Tunnel. Between 1938 and 1953, around 500 steel ribs were installed in an attempt to resist inward movement of the sidewalls and consequential pushing-up of the crown, mostly through two sections towards the eastern end. Several lengths of arch were relined as loose brickwork fell onto the track; speed restrictions were imposed; a settlement of 15 inches was recorded in just 12 years. All this was exacerbated by considerable water penetration of the lining which extensively washed out the mortar. 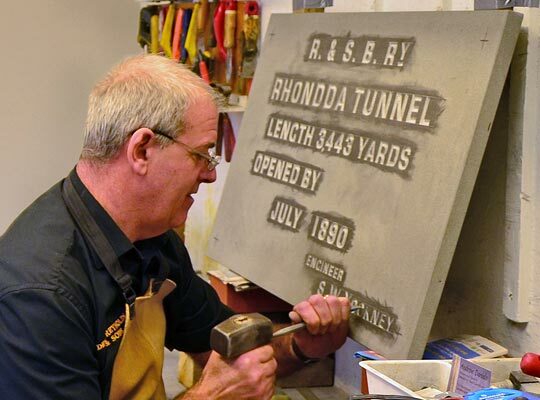 In 2015, engineers carried out Rhondda Tunnel's first examination in 40 years. Severe distortion was observed near the middle of the tunnel in 1967, close to a geological fault. So rapid was its deterioration that the engineer closed the tunnel on safety grounds on 26th February 1968. This was supposedly a temporary measure whilst a decision was made on the future of the line. After much prevarication, the Ministry of Transport cited a decline in usage and the provision of a bus service as justification for the formal withdrawal of passenger services in December 1970. A cynic might suggest that the tunnel’s estimated repair cost of £90,000 also had an influence. It’s not clear yet whether Stephen Mackey can help to unravel the actions of distant decision-makers 46 years ago. Having unearthed the cover stone, he placed an advert on Facebook and in the local paper, asking for help in moving it to a local stonemason for restoration. And so on 9th September 2014, 19 like-minds assembled at The RAFA Club in Treorchy to hatch a plan. Two days later the stone was rescued and it now sits resplendent on the platform end of Treherbert Station. But one of those 19 had much bigger ideas…to reopen the tunnel as a walking and cycling route. The initial response of those around the table was one of predictable scepticism; the reality - 18 months later - is that Stephen is now chairman of the Rhondda Tunnel Society, a charitable body with more than 3,100 worldwide members. 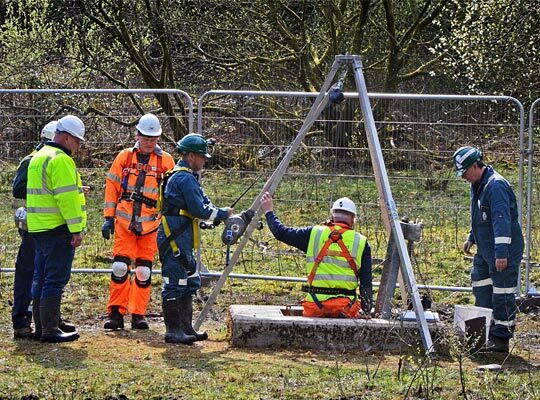 The Welsh Government is engaged, starting negotiations for the tunnel to be transferred into its ownership and commissioning Sustrans to carry out a scoping study on how a reopening might be achieved. Not surprisingly, its conclusion that the economy could benefit by as much as £14.4 million over 30 years has uplifted the campaigners. Some of the tunnel's 500 reinforcement ribs. The vision now is ambitious - a catalyst for the rebirth of the Rhondda and Afan valleys: museum, bike hire, bed and breakfast, a restaurant in the form of a Pullman car, golf buggies offering guided tours. The list goes on. More immediate is the hope that the eastern portal will be excavated so machinery can be brought in to undertake a full survey, and of course prove to any doubters that the thing actually exists. Who knows? As Stephen is keen to point out, this would be the longest cycling tunnel in the world for half the year when the 3,963-yard Snoqualmie Tunnel in America closes for bad weather. He’s become very skilled at public relations! But even as officially the second longest, a consensus is emerging around the tourism and connectivity potential a reopened Rhondda Tunnel could offer. “It’s a full time job I’ve got now”, says Stephen breathlessly. It’s unfortunate that he’s not getting paid for it, but you can tell he’s enjoying the ride.